We believe that weddings should be a gathering that tells your story. And we know that it's those simple and awkwardly raw details that oftentimes fall through the cracks that make up such beautifully, authentic celebrations- which is why we value styled shoots with as much passion as we do. We see them as a platform on which we can inspire and speak truth to all the couples near and dear to our own hearts. This Valentine's Day themed shoot was everything we believe The National Day of Love should be, without any of the cliche B.S. We set up a sweetheart table with fresh strawberries, filled our glasses with pink champagne, and devoured homemade espresso truffles and a hazelnut raspberry dark chocolate tart. Our real-life married couple even exchanged Valentine's with one another, in the form of marriage vows - a slightly more romantic gesture than the elementary school version. The shoot location was intentional. A run-down, industrial, construction site felt like the perfectly imperfect backdrop for a tale of true love. 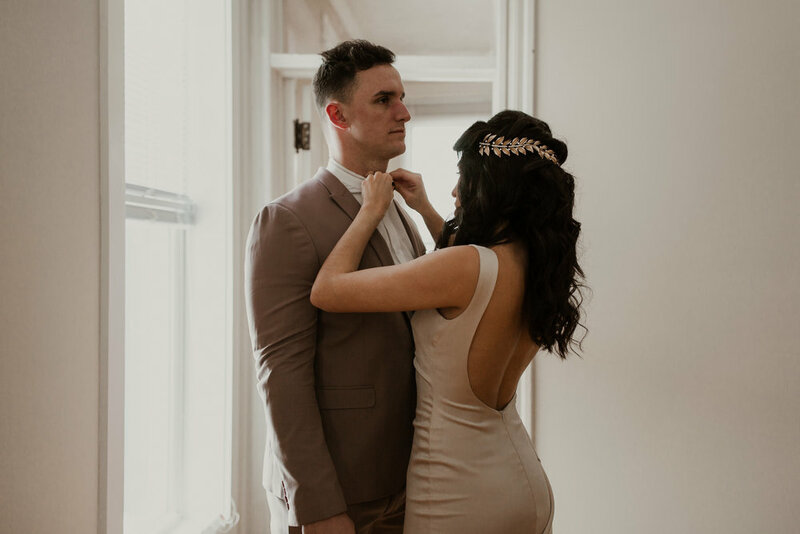 Our goal was to show that the beauty of any wedding or elopement is in the details of one's own love story- not the magic of an exotic land or a dramatic venue. We want to inspire couples to be proud and take ownership of their journey- and to celebrate authentic romance! We couldn't think of a better way to end this Valentine's Day elopement than to fade out with good, old-fashioned candlelight.